The SynCharger is designed for daily use at the bedside table, kitchen counter, office desk, etc… A place to put the multitude of personal items we all carry around so they are easily located again when later needed and always full charged. The Simple and compact design conceals a universal charger compatible with over 1500 electronic devices from most major brands to be charged and synchronized using just The SynCharger. 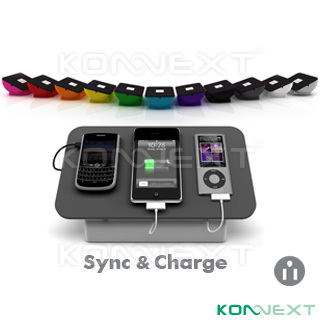 Users can now, charge and synchronize their cell phone, PDA, Blackberry, iPod, MP3 player, and Bluetooth headset simultaneously in one location. The World’s first patent pending circuit design, allowing the SynCharger to automatically select between the Sync Mode and Charge Mode to ensure the devices would be charged and synchronized without any user intervention.